- Blue Steel MC USA Inc.
Fundraiser for Deputy Sheriff Jacob Keltner’s Family. 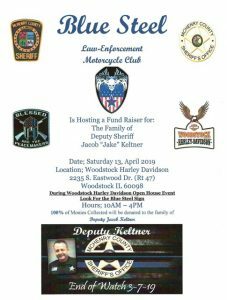 The Blue Steel Illinois chapters will be hosting a fundraiser for Deputy Sheriff Jacob Keltner Family. Deputy Sheriff Keltner was killed in the line of duty 7th March 2019 100% of the proceeds collected will be forwarded to the Keltner family. See the event on our Facebook page.